Everyone likes to travel, as it is the one activity or hobby that can truly help you discover the world. Traveling is mind-opening and fun. It is an opportunity to make new friends, get to know new cultures and more importantly, discover yourself in a way that you didn’t know you can. The opposite of traveling is staying in the same place, drowning in your daily routine and insignificant life events that you tend to pay too much attention to. So, even if you travel, but then return to a mundane life, you risk forgetting everything that you have seen during your travels in a matter of days. One thing that you can do to remind yourself of your experiences is journaling. Having a travel journal that you write in while discovering new places and people, is awesome. Although you might think that it is an old-fashioned habit that can be easily replaced by smartphone apps, there are a few things that technology can’t offer. The relaxing habit of handwriting, reminiscing and turning your thoughts into words, creating a story; these are things that only you can give to yourself. Typing or journal apps can be useful, too. But guess what? They destroy the authenticity of writing. More than that, writing on your phone can be difficult, as there are so many temptations and distractions online. Notifications, alerts or messages can’t be seen on paper while handwriting. Also, it is more private that any phone on the planet. If you want to write your travel memoirs and keep track of your experiences, then you should buy a high-quality travel journal. To make it easier for you to purchase the right product for your needs, we have selected 5 of the best travel journals on the market. We have reviewed them and highlighted their pros and cons below, for your ease. Check them out. 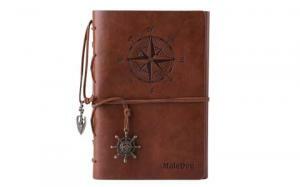 A good journal that you are planning to use for your travel memoirs will last for years and will have a great design. This way, it will draw your attention every time you will see it and will help you relive your experiences. This product has a great cover, with a compass design. It is made of leather and has two metal accessories that make it even more attractive. It comes in 5 different colors, from brown to blue. It has 160 pages and a metallic binder that opens and allows you to refill the journal over time. Its pages are ideal for both writing and drawing. Also, they are thick enough to be used for image or picture sticking, as well as for watercolors and markers. The surface of the pages is smooth, yet it doesn’t allow gels or ink to leak. The journal can be used as a daily notepad, a photo album or a sketchbook. It is durable and its PU leather protects it from humidity. It measures 4.9 x 7.2 inches, which makes it great for traveling. Refilling it is easy thanks to its basic mechanism. All you must do to add more pages is to press the two buttons that it has at the top and bottom at the same time or pull the ring outwards, or inwards to close it up. If you are looking for a travel journal that is larger than the previous one and you are ready to pay a bit more for it, then this authentic, natural leather model is exactly what you are looking for. It measures 8.5 x 4.5 inches, but it comes in larger sizes, too. 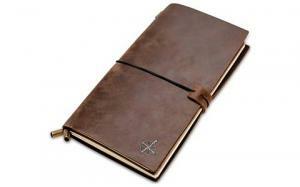 Its cover is completely made of genuine leather that changes the journal’s aspect and feel. It is more durable and the fact that it is refillable allows you to use it for years. It has 90 double-sided pages, its refills are available online and its pages are thick and suitable for drawing, writing, sketching or photo sticking. The fact that this journal is hand crafted can be observed from a distance and shows the manufacturer’s attention to details. If you like to draw or sketch, too, this product is ideal for you, as it has 3 blank paper inserts included. The refills and inserts that the manufacturer offers are blank, lined, dot grid, planner and graph pages. If you like to have a pen or pencil attached to your journal, this one also satisfies that need, thanks to its pen ring. 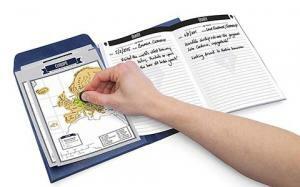 The binder is durable and easy to use. It also comes with elastic and leather band that acts as a fastener. 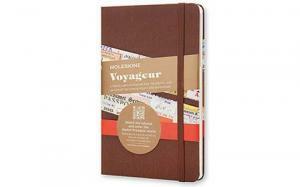 A travel journal that looks like a diary is great if you simply want to write things you observe, memories or ideas. However, if you like to follow a specific format when writing your travel memoirs, as well as maps that you can draw on, you need more than that. This product comes at a medium price and offers a lot of great features that will satisfy the needs of the most detail-oriented travelers. It is a premium product that comes with 8 unique scratch maps, covered in gold foil. Each map contains a different part of the world, allowing you to organize your writing and notes using visual elements, too. This product measures 8.9 x 0.8 x 6.7 inches, which makes it larger than most similar journals. It has 64 pages and comes in blue. The sheets’ size is 1 x 1.5 inches. It is a perfect product for travelers, as it is versatile, durable and complex. Its only downside is that it doesn’t have a page binder. All its pages are simply inserted into the cover, without anything keeping them together. Giving this fact, you will have to be more careful and ensure that you don’t lose any important pages. On the other hand, more pages can be inserted, and you could even use the cover for other purposes. Another great option for someone who wants to buy a practical travel diary is this product from Moleskine that comes at a good price and that comes with high quality cover and pages. 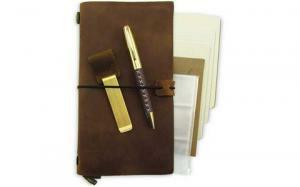 This is a versatile product that serves as a journal and planner at the same time. It includes detachable packing lists, daily planning sections, as well as budget pages. It has a hard cover, elastic closure and a bookmark ribbon. It comes in nutmeg brown and it measures 4 x 7 inches. The difference between this journal and others in this list, besides page contents, is that it has 208 pages. If organizing and planning is easier for you when visual elements are present, then the sections with colored tabs of this diary will be of great use for you. Also, you might find the ruled, dotted and plain pages helpful. The list pages are detachable, so you can place them wherever suits you best. It includes a sheet of stickers, too. If you are interested in the quality of the paper, you should know that it is acid-free, FSC certified paper and it weighs 70 gsm/47 Ibs. All the pages in this journal are numbered, so you can find the information that you are looking for easily. The last product in our list is a refillable leather journal that comes at a slightly higher price, but that reflects undoubtable quality. If you want to buy a travel journal that is easy to customize and that can be used for various purposes, then this is one of the best options that you have. It can be used as a daily planner, diary or travel journal. It becomes a pleasure to write down your memoirs or notes about the places that you are visiting. Especially if you are a travel write or an artist who would rather stay away from technology when writing, the design and feel of this product will make your experience much more authentic. The cover is made of genuine leather, it is thick and soft, and it is more than obvious that is was hand crafted. This product is designed to last forever. It measures 8.5 x 4.75 inches, it comes in antique brown and it is flexible. Although it doesn’t have a page binder, it comes with 3 sections that allow you to store your pages securely. the 3 sections contain plain, lined and graph paper packs, and a PVC zipper pouch is present, too. The color of the pages is cream, which gives it a vintage feel. Except for having a classy cover, an elastic strap and a pen holder, it also has a golden clipper that ca help you organize so much better. Another great feature is its card holder and its metal toggles. Writing in a journal is incredibly relaxing. It can turn out to be a healthy exercise for the brain and at the same time, it helps you store your memories, so that you can go back to them and relive your travel experience every time you want. Choosing the best journal for your needs should be easy. You only have to think about the elements that are important for you. The size, the number of pages, organization elements, format of the page and so on. Also, you have to think about whether you want a journal that is refillable or just a basic one. The design is another important element that you should take into consideration. Apart from visual elements that might seem appealing, the material of the cover, the quality of the paper, the durability of the binder, are all important. Last, but not least, you should consider the price and make sure that you don’t overpay.